This new unit is equipped with the most up-to-date and sophisticated instrumentation that exists in the speciality of Nuclear Medicine. Hospital Clínica Benidorm has acquired a latest generation Tomography gamma camera fitted with a dual detector and CT scanner and a multislice (16 slice) PET-CT scanner – the biggest breakthrough in the diagnosis of cancer diseases. The combination of PET’s morphological image and CT’s functional image has turned the hybrid PET-CT into the methodology recommended by most oncology experts. The two Nuclear Medicine systems that have been installed in Hospital Clínica Benidorm enable the detection and monitoring of diseases such as malign tumours, response to cancer treatments, detection of sentinel (lymph) nodes, ischaemic heart disease, Alzheimer’s, bone injuries in athletes, renal diseases in children and adults, pulmonary thrombosis (embolism), thyroid and parathyroid, epilepsies that don’t respond to treatment, etc. It also allows us to carry out other activities that are of great use for the patient such as planning radiotherapy sessions or surgery in anatomically complex areas. All of this guarantees a non invasive, reliable technology that is comfortable for patients and highly sensitive to detecting lesions. Therapeutically speaking, patients with hyperthyroidism, arthritis, lymphoma, carcinoid tumours and metastatic bone pain will notice the benefits. This state-of-the-art technology places us on the cutting edge in clinical care, not only in our own country, but also in the European Community. Our first and foremost concern, however, continues to focus on a humanised patient care approach. This, we believe, is our best investment. We always do the best we can because we believe that a step forward in technology means a step forward in protecting your health. Clínica Benidorm presents its new 64 slice CT with the addition of ASiR capabilities, which enables the radiation dose to be reduced by between 50 and 83%. This new CT system incorporates innovations in heart diagnostics and cancer screening and has innovative means of support for detecting chest and colon diseases. The new LightSpeed VCT with ASiR technology opens up a new dimension in imaging detail providing High Resolution images, clear display and enhanced diagnostics for the full spectrum of diseases. ASiR™ (Adaptive Statistical Iterative Reconstruction) New, exclusive image acquisition technology which allows for lower exposure doses and is in line with the concept of healthymagination (healthy living). The youngest patients, cancer patients who need to undergo examinations on repeated occasions, are the ones who most benefit from this reduction. 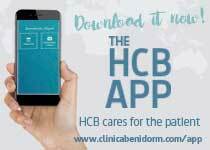 Clínica Benidorm presents a number of new solutions in CT scanning (Computerised Tomography) for the care of all types of diseases related to cancer and other pathologies. 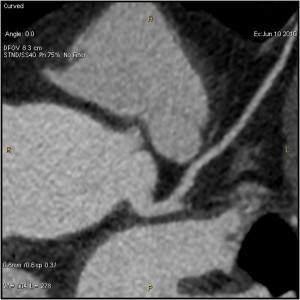 Coronary CT angiography complements studies using catheterisation, thus becoming an important tool for helping doctors to identify patients who do not have any lesions or that are insignificant. It helps to enhance efficiency in hospitals. High Definition and ultra low doses help towards providing better care for patients. In addition to this, these studies can be carried out in a really short period of time (5” procedure). It is likely that CT scanning is the technique most used in the location and monitoring of lesions. 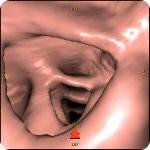 This new CT provides the possibility of obtaining new diagnostic techniques, such as organ perfusion, to provide functional information about organs, monitoring of pulmonary nodules and chest related diseases, the carrying out of virtual colonoscopy to diagnose colon related diseases such as polyps or diverticulitis. The principle advantage with all these diagnoses is that they are carried out using low doses. 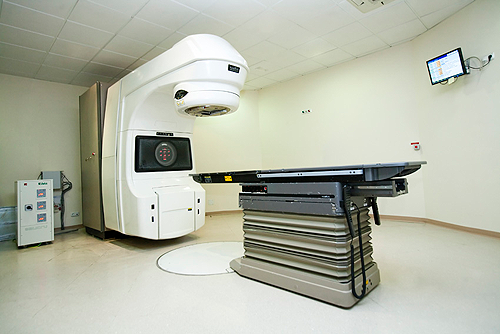 In addition, it is fitted with advanced oncology software that allows comparisons with previous CT scans to be made – regardless of whether they were done using the same scanner – as well as contrasts with studies carried out using other imaging techniques (MRI or PET/TC). There have been a considerable number of technology breakthroughs in diagnostic imaging in medicine and the demand for CT scans has become common for diagnosing all types of diseases. In order to provide the latest CT technology, GE Healthcare have launched a dose optimisation plan to help make doctors more aware of the need for minimising the risks associated with these procedures. In this way, the radiation dose that a patient receives is reduced by 50% in routine whole body (chest, abdomen, etc) scans and by up to 83% in heart studies, if compared to the does received by patients using other procedures. This does not however mean there is a reduction in the quality of the acquired images. It means totally the opposite, as there is an increase of around 20%. The coronary angiogram is carried out using a 64 slice CT scanner enabling the radiation doses to be reduced by between 50 and 83%. Volumetric reconstruction. LIMA to LAD.bypass. Stent in Cx.artery. This radiology test enables heart arteries to be seen without having to catheterise the heart or coronary arteries directly. 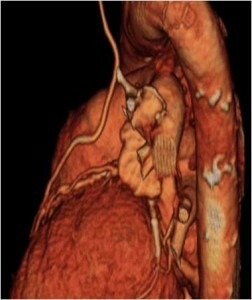 Using an iodine based contrast injection and a 64 detector tomography, in just 10 seconds of apnoea (patients are told to hold their breath for 10 seconds after filling their lungs with air) and 5 seconds of exposure to radiation it is possible to obtain reliable images of the coronary arteries, thus enabling a safe diagnosis of the anatomy of the arteries and detection of the presence of coronary calcium or soft lipid plaques (cholesterol). 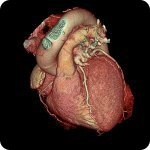 When is CT coronary angiography required? Patients where the aim is to rule out heart disorders. 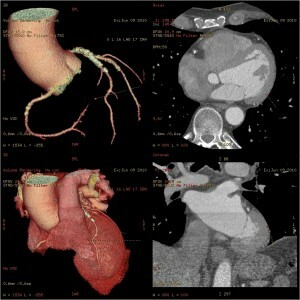 Assessing permeability of aortocoronary grafts in patients operated for a bypass. Varian 2100 CD Electrons Linear Accelerator: Capable of producing photon beams in two energy levels and electron beams in six. It has two multi-leaf collimators; one for large fields and the other, micro-multi-leaf, for high precision treatments, as required for radio-surgery, stereotaxic radiotherapy and modulated intensity radiotherapy “IMRT”. 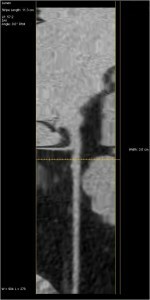 Ultrasound-guided bronchoscopy is a minimally invasive diagnostic technique that complements flexible bronchoscopy. By using ultrasounds (echography) it is possible to see structures that are adjacent to the respiratory air passages (such as lymph nodes), as well as taking samples using a needle (in real time) with hardly any complications other to those found in conventional bronchoscopy. The penetration of the needle is monitored at all times. 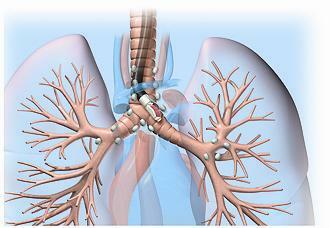 It will soon become an indispensable examination for studying the spread of lung cancer and will avoid more aggressive diagnostic approaches such as mediastinoscopy or mediastinotomy (surgical interventions that require admission to the hospital for several days and have a greater risk of complications). Compared with other types of tests used in lung cancer studies, it has the advantage of guaranteeing the nature of the damage, as it allows samples of lesions up to 5 mm (diagnostic rate greater than 95%). It can also be of great use in diagnosing other types of diseases (not only of the malignant type). As the test is carried out through the mouth, sedation is administered to make it easier for the patient to handle. Under normal circumstances, the patient can go home a few minutes after the examination ends, without the need for being admitted. There are at present very few centres in Spain who can provide this technology (due to the costly equipment and need for trained staff). 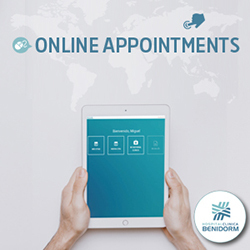 Hospital Clínica Benidorm is proud to be the first and only private medical centre in the Region of Valencia to provide an ultrasound-guided bronchoscopy service for patients. The latest clinical technology in MRI (magnetic resonance imaging) equipment is the 3T scanner. This is the only one in our province. 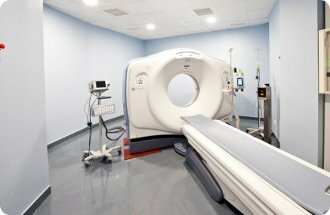 Our cutting edge equipment provides clinical MRI images of the whole body, musculoskeletal system, the chest, abdomen or neurovascular system, as well as most advanced spectroscopy, tractography and Functional techniques. Its technical characteristics enable us to obtain high quality, anatomical images of the musculoskeletal system, outstripping all other scanners having less magnetic field capacity. In abdominal studies it is possible to obtain a large number of images in a matter of seconds, thus reducing scan times. In the field of neurology, this scanner is much more sensitive in spectroscopy and tractography – techniques which are used in the study of tumours and their affect on surrounding brain tissue. Functional studies are used to assess alterations in the motor, visual and auditory functions in each part of the brain; alterations that are not detected with conventional means. Our facilities are rounded off with a sound system and screens to keep patients entertained during the procedures, which include documentaries and films. This helps to reduce claustrophobia and makes it easier to carry out procedures on children without the need for anaesthesia. This is a non invasive exploratory technique which is useful for studying the retina and optic nerve. Its main advantage lies in being able to obtain high resolution images of both the surface of the retina and its different layers. 3D images of the retina can be achieved after computer processing. The technology is based on a complex optical principle called interferometry, which uses an infrared light source which penetrates the tissues of the eye and splits into different rays of light. One of them penetrates the eye and the other is captured by a reference mirror. On their return path, both rays collide with each other producing “interferences” which are captured by a detector and converted into a colour image showing and indicating the thickness of the tissue being studied. Cold colours, such as blue or black correlate with less thick tissue, whereas hot colours, such as red or white, correlate with thicker tissue. A thickness study of the different layers of the retina can prove useful for the diagnosis and monitoring of different eye disorders. The patient sits down for the examination and there is no need for anaesthesia or sedation. Neither anaesthetics nor flashing lights are used. Unlike in other eye examinations, it is usually unnecessary to dilate the pupil beforehand. The examination lasts just a few minutes. Although it is a highly complex technique, it is an easy test to carry out and the patient hardly feels any discomfort. There is no fasting involved or any other type of preparation. The study is totally painless and has no associated adverse affects. Rarely, the patient may note slight discomfort in the eye accompanied by watering of the eyes and a stinging feeling in the outer layer of the eye and inner surface of the eyelids, which wear off a few minutes after the study. In patients who need to use mydriatic eye drops, the most common side effects are blurred vision and flashing lights. On rare occasions, there could be an increase in intraocular pressure. As there is no need to use flashing light or anaesthesia, optical coherence tomography can be considered a safe exploratory technique. There are no contraindications for the use of optical coherence tomography. Although eye drops to dilate the eye are not usually used, they must be particularly avoided in patients suffering from closed angle glaucoma. It is of utmost importance to diagnose a problem with the sight in its early stages. Sometimes, a simple examination using an ophthalmoscope is enough to reach a diagnosis, but for cases in which the examination is insufficient it will be necessary to fall back on more sensitive techniques. Through optical coherence tomography, we are able to measure different areas on the retina, as well as its layers. The discovery of any anomalies in the measurements taken could be linked to different eye problems. Once the diagnosis has been made, it may be useful for monitoring their progress and response to different treatments. It can be used in relation to several eye disorders, such as age-related macular degeneration (loss of vision), glaucoma, diabetic retinopathy (eye disease), central serous chorioretinopathy and epiretinal membranes. GE Healthcare present a new system in their range of nuclear images – GE Infinia, which will enable doctors to see more, boost their confidence in the diagnostics and improve patient care. Infinia is a free-geometry nuclear medicine system with slip-ring gantry, Infinia combines the flexibility of a single-head camera with the productivity of a dual-head design. It delivers unmatched image quality across the full energy spectrum. And unique in the industry, Infinia arrives ready for the exclusive Hawkeye SPECT/CT, offering the utmost in diagnostic confidence. The Xeleris Workstation to deliver more effective workflow with advanced Ignite technology, unsurpassed connectivity, and the ultimate in ease of use. GE Ignite offers fast automated exams at the touch of a key for the most common procedures in nuclear medicine, from scan through to processing and viewing on Xeleris. Intuitive user interface shared by capturing and processing for easy use. Take the most comprehensive clinical applications package and combine it with Infinia’s flexible gantry and you’ll soon see why this is the most versatile and enterprising nuclear medicine system available on the market. Thanks to its single-head flexibility, Infinia’s dual-detector system can adapt to all needs, including standing, sitting, wheelchair and stretcher scanning positions. 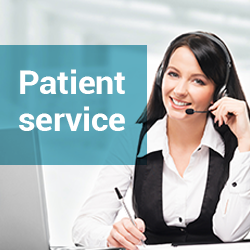 Widest range of clinical applications, including 50 exclusive and 11 industry-standard application and processing packages on Xeleris. Form and function. CT and SPECT – the future of nuclear imaging. In the same way that PET/CT combines anatomy and physiology for pinpointing PET tracers, only GE’s exclusive Hawkeye provides the same capability for SPECT procedures. Infinia Hawkeye provides unprecedented diagnostic confidence with precise disease detection and localisation, as well as advanced attenuation correction.